Cheers to the holidays! In this merriest of months, we thought it would be fun to focus on some festive holiday cocktails. We asked a few neighbors to share their favorites – their gifts to us all. Merry Christmas, Happy Hanukkah and Happy New Year! Combine all the ingredients in a blender and process until smooth. Pour into glasses, and garnish with mint leaves and crushed sandwich cookies. 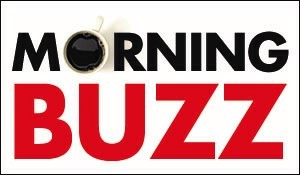 On the not-so-sweet side of tequila, Jeri Amundsen and Arthur Feldman, both attorneys (she’s retired) like a good margarita, and they often find that the ones they make at home are the best. Sometimes Jeri and Arthur top the margaritas with a little Topo Chico to dilute the tartness of the lime. In cooler months, they suggest using mescal, tequila’s smoky cousin, in place of tequila. Wet the rim of an Old Fashioned glass with tequila, and dip it in salt to coat the rim. Shake tequila, lime juice and Cointreau in a shaker and pour over ice in the salted glass. Float a jalapeño slice or two on top and serve. In a small saucepan, bring blackberries, water and sugar to a boil. Reduce heat and simmer for 10 minutes, until the blackberries are soft and the simple syrup has turned a bring pink/reddish color. Remove from heat, drain blackberries and allow to cool. This step can be done well in advance, as the syrup will keep for at least a week in the refrigerator. To prep the champagne flutes, use butter to adhere the sugar on the rims. Place the tiniest amount between your fingers and rub just around the rim of the glass before dipping the glass into the gold baking sugar. Add 1 ounce of gin to each champagne glass. Drop two blackberries in each glass, followed by 2 ounces of homemade blackberry simple syrup. 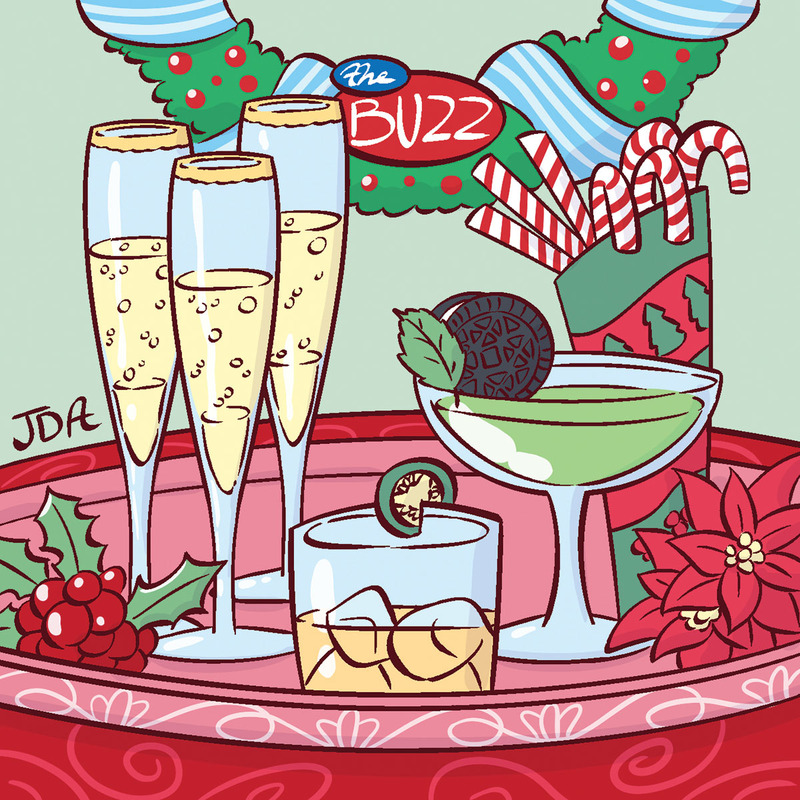 Fill the rest of the glasses with champagne and top with a sprig of thyme in each glass. Makes 4. 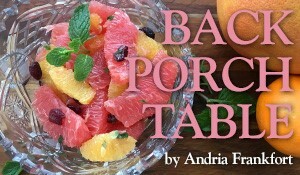 For more on food and entertaining from Andria Frankfort, see her weekly blog, Back Porch Table, at thebuzzmagazines.com. Every Friday, you’ll find new recipes for weekend cooking (or anytime).